Blog | Meeting Change | Growing business, sustainably. This past December, I had one of those great meeting moments – you know the kind that leaves you inspired and reminds you how face-to-face meetings really are amazing. I met with Nancy Zavada and Shawna McKinley (two amazingly talented women who are experts on sustainable events) and we wrote a book. In a weekend. The three of us had been noticing that there was a need for an easy reference tool for planners who are interested in making their events more sustainable. So we gathered around a table, each equipped with our stack of index cards full of tips and shuffled them into categories. We had hoped to come up with 101 tips, but ended up with 167. The book details all of them, and also includes several infographics on specific topics. 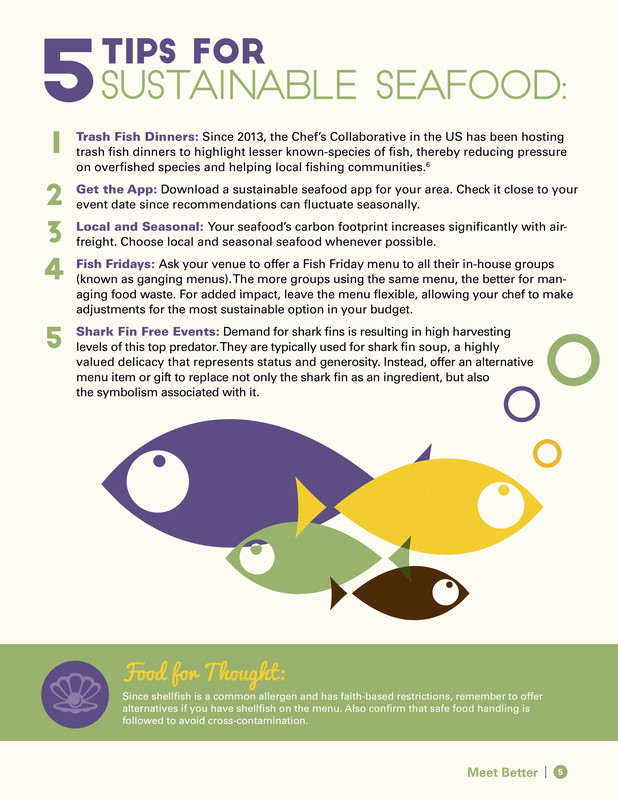 Here is one on sustainable seafood that was prepared by our phenomenal graphic designer, Erika Abrams. Want to learn more? Copies of the book are available for pre-order here. Use the coupon code “preorder” for a 20% discount. The books will be printed in time for World Environment Day in early June. 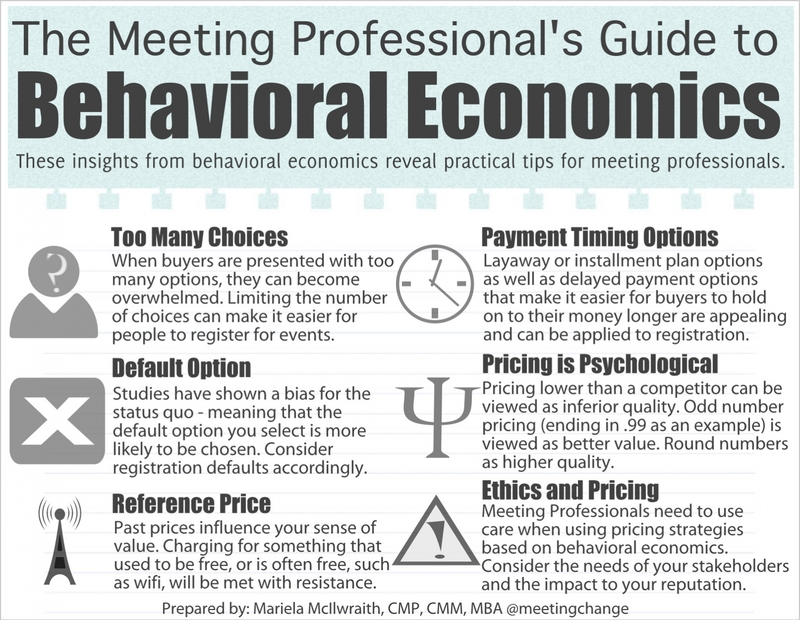 Check out Shawna and Nancy’s blogs for other unique infographics to help you Meet Better! Today, the Convention Industry Council opened up nominations for CMP Influencers. It’s a social media campaign to recognize those CMPs that are making a difference in our industry and is part of the 30th anniversary celebration of the CMP designation. It’s also an opportunity to recognize people that have had a profound influence on our lives as professionals. Nominations will be accepted now until May 22, 2015 via social media. Post the nomination to the CMP 30th Anniversary Facebook Event Page or the CMP Twitter account the phrase, “I nominate (insert full name) from (insert organization) as a #CMP30 Influencer.” Include the hashtag #CMP30 and a few reasons why the person should be nominated, if space permits. Nominations are open to the public; however, only nominees who have obtained and are current with their CMP designation will be eligible for consideration as one of the top 30 CMP Influencers. Once the public nomination window closes, the 30 CMP Influencers will be selected during a two-part process. Nominations will be aggregated and tallied via Facebook poll votes during the month of June, after which a committee will meet to select the final winners based on the number of Facebook poll votes, personal influence on peer(s) and community/leadership presence. The #CMP30 Influencers will be announced in July of 2015 and will be honored with a special reception at the upcoming CMP Conclave, September 26-28, 2015, in Reno, Nevada. When I was working on the CIC Manual, I was fortunate to collaborate with 4 exceptional reviewers who each influenced the course of the book in different ways. Terri Breining (Breining Group, LLC) has a wealth of knowledge about our industry, and always applies both a strategic and an ethical lens to her reviews. Eric Rozenberg (Swantegy)helped keep international perspectives at the forefront – something that is so critical in our global industry. Roger Simons (MCI) provided sustainable event expertise – this was fundamental for the approach we took of integrating sustainability throughout the manual. Tyra Hilliard (@drtyra) is my “go to” for industry legal questions, and her way of analyzing and managing risk has changed the way I plan meetings. And… CIC’s own Lawrence Leonard is one of the smartest people I’ve met in this industry and is great at identifying what CMPs need to know in order to make meetings more successful. When I want to know what’s next in our industry, I look to Elizabeth Glau (Building Blocks Social Media) and Tahira Endean (QuickMobile). Elizabeth has a deep understanding of the potential of social media to enhance events. Tahira’s knowledge in the areas of both meeting design and mobile technology has shaped my understanding of the importance and value of both these fields for our industry. If you have a question about A/V, ask Jon Trask (A/V for Planners). I have really appreciated learning from him about selecting the right technology, not just what’s new and shiny. 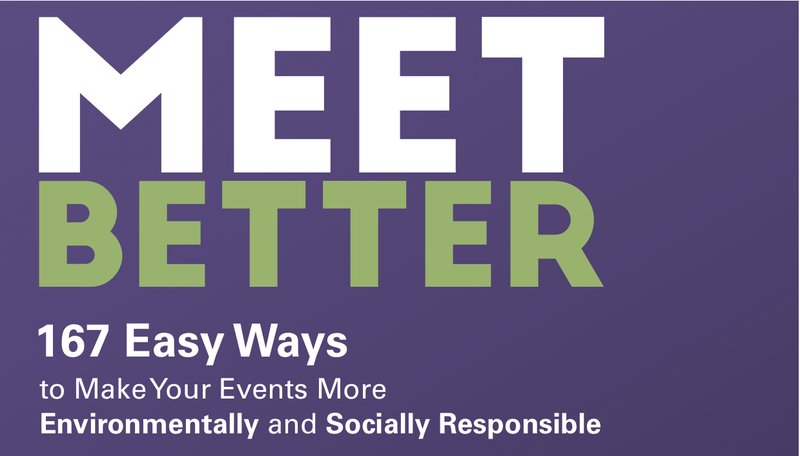 Nancy Zavada (MeetGreen) is incredibly knowledgeable about sustainability and her dedication to advocating for sustainable events has had a tremendous impact on the way meetings are designed and managed. Janet Sperstadt (Madison College) shares her vast expertise as an educator and is making a difference for the next generation of meeting professionals. There are people in our industry whose work is redefining the way that we conduct business. Eduardo Chaillo (Global Meetings & Tourism Specialists, LLC) has a deep understanding of the forces affecting our industry and leverages this knowledge to influence a positive evolution; and his dedication to mentoring is inspiring. Christine “Shimo” Shimasaki (DMAI) has helped us to have a richer understanding of the value of meetings through her work on empowerMINT. Karen Gonzales (also from DMAI) has been a longtime champion of cross-cultural communication and the value of diversity. Which CMPs are on your list? I’m honoured to have an article in this month’s MPI One+. A quick recap of the article can be found below. Water Footprint Network – this is my “go to” page for water footprint information. Their product gallery is incredibly useful and has strong scientific background. National Geographic Water Footprint Calculator – great way to measure your household footprint. ONE DROP’s Calculator – gives you the water footprint of what’s on your plate. Shawna McKinley’s blog post on how much water is saved using water stations instead of bottled water.